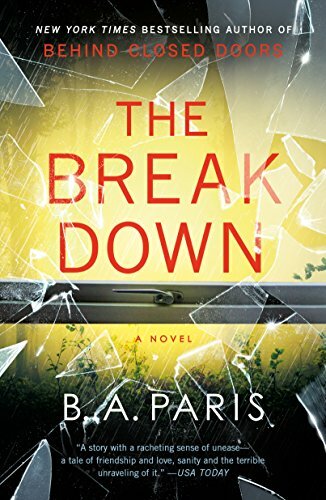 The Breakdown is a nail-biting, psychological thriller that will take you through the wringer as you read it. There is a fine line when writing books like these. The author can give too much away in the buildup and it ruins the rest of the book. It didn’t happen with The Breakdown. I read this book within a day. I had my Kindle on me at all times, I was that engrossed in it. Everything about it had me not wanting to anything but read. See, I am the type of reader that will read a few chapters, put my Kindle down, get involved with other things and then remember…hey I was reading and repeat the cycle. So for me to actually not put down my Kindle, the book had to be good and The Breakdown was. The two main storylines (the murder and Cass having a breakdown) were wonderfully intertwined. There was a point in the book where I couldn’t help but wonder if Cass had anything to do with the murder. But I was vindicated later in the book and then had to wonder who the murderer was. Let’s just say that I was very surprised by that and by the reason that woman was killed. I did figure out certain elements of the book before they were revealed. But kudos to the author because she did do a wonderful job keeping who was stalking Cass under wraps until the end of the book. The details and the length that this person went through to actually drive Cass to a nervous breakdown was insane. The end of the book was very anti-climatic but good. Why: A great storyline and memorable characters.